William C. Chip was born in New Castle, Pennsylvania, on July 26, 1919. His father was the famed George Chip, former middleweight boxing champion of the world, also from New Castle. William played football in 1936 and 1937 for New Castle High and went on to Duquesne University. He was accepted into the US Naval Academy and played quarterback for the 1940-1941 teams under famous Navy Coach “Swede” Larson. 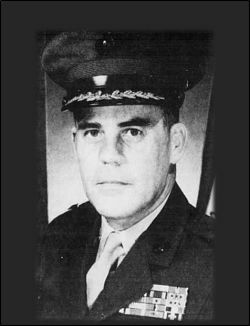 In 1942, he received his commission in the Marines. He saw action aboard the cruiser Honolulu, participating in the bombardment of Saipan, Guam, Peleliu and Leyte during War World War II. He was a chief of amphibious planning, striking and support forces in the Southern European Theater. In 1949, Captain Chip became head coach for the Quantico Marines’ Football Team. Chip also served as a battalion executive officer in Korea, receiving the Bronze Star for his service in 1953. He served as an aide to the Under Secretary of the Navy at the Pentagon in Washington from 1963 to 1965. In September 1967, at the age of 48, he was promoted to Brigadier General. Shortly afterwards, he was sent to Viet Nam as the 9th Marine Amphibious Brigade Commander. On September 17, 1968 he suffered a spine fracture from a helicopter crash while directing troops in an operation eight miles south of the DMZ. He spent five months in the hospital. In 1971, he was promoted to Major General. The following year, he retired from his position of Quartermaster General of the Marine Corps and settled in Florida. After having served our country for 30 years and three wars, he died in June 1992. He is buried in Arlington National Cemetery. His wife was the former Jean Waddington also of New Castle. They had three children: William W., John D. and George M.
William C. Chip is buried in Arlington National Cemetery. He was honored (along with several other high ranking servicemen) by the County in 1977 by the placement of his name on a plaque that was prepared for the courthouse hallway. OOHRAH!